Talladega, April 2009. Over the final two laps of the Aaron’s 499, Carl Edwards and I had done something that had never been done at the track before: tandem drafting. Less than a minute earlier, we had been running eighth and ninth. Carl took the lead at the start-finish line with one to go. Now, on the final lap, we were racing for the win. I had been running a Nationwide car since the start of the season for JR Motorsports. We were having a dismal year. The first three Nationwide Series races, I wrecked out of. Things were no better on the Cup side. At Las Vegas, in my first race for Hendrick Motorsports, I wrecked out on the first lap. I was almost at the point of getting cut. I remember having the conversations. When faced with adversity, you either define the moment, or the moment defines you. Carl had the lead. But as we went into the final turn, I knew that I was going to have one last chance to try and pass him. I also knew that it was going to become a game of chicken. I didn’t want it to be that. It didn’t matter. I made a move on Carl. He blocked it. What went through my mind was a combination of two things. One was: Don’t blow this opportunity. You might never get it again. You need to prove that you’re a winner on this level. The other was frustration and anger at Carl. He was going to test my will to win, my resolve. Everyone has a moment where they have a tough decision to make. And when faced with adversity, you either define the moment, or the moment defines you. I needed to win that race. 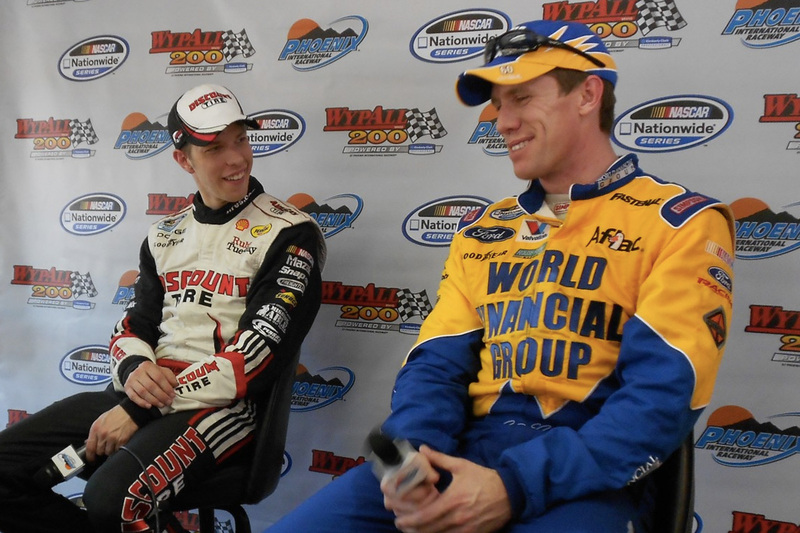 Carl Edwards and I have had one of the strongest rivalries in NASCAR in some time. I get questions about it constantly from fans — not just about rivalries, but specifically, about my rivalry with him. Given that Carl won last week and I won the week before, this seems like a pretty good time to talk about it. Carl and I have an interesting history. It really began in 2003, six years before Talladega. At the time, my family had a truck racing team out of Michigan, K-Automotive. So did Jack Roush. It was an interesting relationship. Most teams are based out of North Carolina. Ours were not. When we went to races, we would fly on the same commercial airlines, things like that. We had a little bit of rivalry because we were both Ford teams, and both from Michigan. Roush’s teams, at the time, used to have this thing they called the Gong Show. The Gong Show was named after the famous TV show where you showed your talents, and got gonged if the judges didn’t like you. Only this was for drivers. They auditioned drivers all the time. And despite the rivalry, I always wanted to try out. My family’s race team would never be big enough for me to get a real opportunity. It just didn’t exist. I was hoping I would get that opportunity there. Carl participated in one of those Gong Show auditions, and got his foot in the door. Off he went. CARL AND I RUNNING THE NATIONWIDE. In the 2003 season, I was really hungry for a break. When I saw Carl get that opportunity, I wanted to learn from him. We struck a very casual friendship, the kind that sometimes happens at a race track: Him as a race car driver, me as a mechanic/some kind of understudy. We started a relationship. I’ll never forget it: I was there for his first NASCAR win at a truck race at Kentucky, working on my family’s team truck. I remember walking into the bathroom at Kentucky. There was Carl. It was one those urinal conversations that you sometimes have. “Hey man,” I said, “congrats on the win.” I said it quietly, reserved, because it was obvious that I wanted to be where he was. I think he knew that, too. That was a confidence booster, and made me feel good about him. We developed a little bit of a friendship. In fact, some of the guys on the family team used to make fun of me because they said I wanted to be just like Carl. They cut out a picture of him and taped in my locker at the race shop. At that time in my life, Carl had everything it was that I was looking for. A couple years later, Carl graduated out of the truck series. I was hungry to get that opportunity with Roush, but it never came to fruition. Still, I kept up that conversational relationship with Carl. In my first blog, I talked about how you run into people who say they’ll help you, but a lot of times, it’s just talk. A lot of times when I’d run into Carl, he’d say to me, “When it comes time to help you, I will.” But nothing ever came of it. I had this one opportunity, and I was afraid it was going to go away. So I was going to fight like hell to make sure it didn’t. I never knew how to take that. I was in a place where I wanted something, anything, to happen to help my racing career. And it wasn’t happening. Obviously, that wasn’t Carl’s fault, and maybe it was unfair of me to expect anything from him. But the way we interacted put a stress on our relationship before we ever really competed against each other. I always wondered, “Were you being real or not? Further down the road, around 2008, we really started competing against each other. I had a chance to win a Nationwide race in Las Vegas. Carl and I wrecked together. It wasn’t really either of our faults. It was just kind of a racing deal. But afterward, Carl made it a point to not acknowledge what had happened. That rubbed me the wrong way. At the time, I was doing everything I could to make it. I had this one opportunity, and I was afraid it was going to go away. So I was going to fight like hell to make sure it didn’t. Carl was a driver at the Nationwide level. And I viewed all of his success at the Nationwide level as the success of someone who was taking away from my opportunity. When people come up to me now and say, “I’m a Nationwide only or Nationwide stand-alone driver, and when you compete in the Nationwide Series, you compete for or take away from my opportunities,” I understand where they’re coming from. Today, I also understand why they’re wrong. Looking back, it’s clear that I wasn’t as secure or confident in my skill set then as I am now. I didn’t really understand how the Nationwide Series worked. Quite frankly, if it wasn’t for guys like Carl Edwards or Kevin Harvick or Kyle Busch or whoever it was at the time competing in that series when I was a stand-alone driver, I would never have been able to have a sponsor like the U.S. Navy. There would never have been enough attention to the series. I would never have gotten the opportunity. But that wasn’t how I saw it then. When 2009 came around, I was in a really tough spot for a couple of reasons. I had just signed on to drive the No. 5 Cup car for Hendrick Motorsports, sharing duties with Mark Martin. That was supposed to be part-time through the 2009-2010 seasons, and then full-time in 2011. But it was performance based. There was also another catch: If Mark was winning and successful, he was going to run the car in the 2010-11 season, too. The week before Talladega, Mark won at Phoenix. As I said earlier, the year had started off about as badly as it could have for me. I was in a really tough spot, with pressures on every angle. So there were a lot of things that affected how I drove around Carl — and everyone else, really — during that time span. I’m not sure if Carl will ever understand where I was coming from, and I’m not sure if I’ll ever understand where he was coming from. Which brings us back to the final lap at Talladega. The way I saw it, it was really my opportunity to leave a mark on the sport. I knew I couldn’t waste it. As we sped toward the finish, I was hoping I would get two moves. If I made one move, he would call it. And he did. I was hoping — and looking back, I guess it was a foolish hope — that he wouldn’t call it twice. I wanted to get him far enough to the right side of the track to get by him on the left. My hope was that he would realize he’d been beat, and allow me to make the move. That didn’t happen. That left me with two options. I could either turn left and be penalized for going below the yellow line, and not win the race. Or I could hold my ground. There was also this: A year earlier at Talladega, Regan Smith had dipped below the yellow line on his way to winning a Cup race. He was disqualified. In that moment, I felt like I had to hold my ground. I don’t feel like I wrecked Carl. There’s a difference. At the end of the day, I would still stand behind that. I could understand why Carl wouldn’t feel that way. Our cars made contact. Carl started to spin. I pushed through him and sped toward the finish line. What happened next was one of those things that gets stuck in your head that you never really forget. In my rear view mirror, I saw Carl’s car wreck, flip and fly into the grandstands. It was surreal. I thought he was dead. That was the first thing I thought. I knew he hit really, really hard. I was hoping he was okay. I didn’t want to see him get hurt. A week or two later, I sat down with Carl inside his motor home and talked about the crash. The conversation went really well. Quite honestly, I was left with the impression that he understood what had happened, and that we were going to move on. A couple things changed. In 2010, I went to Penske and became a legitimate contender race in and race out in the Nationwide Series. We took the points lead in the Nationwide, and ran with it for the first three or four months of the season. That was pretty significant because Carl was one of if not the favorite to win. We got into a turf war of sorts, two alpha males trying to be the biggest dog. I got into a wreck with him at Memphis. It was definitely my fault, but it was a racing thing. It was a restart. Everyone was jumbled up. Someone in front of him checked up, and I ran him over. I actually talked to him on the phone afterward, and told him, “Hey, that was my bad.” He was upset about it, but I felt that he understood what happened there as well. Then we got to Atlanta. Early in the race, there was a double file restart. I was still very new to them at that time. He was in the top lane, I was on the bottom. Atlanta’s a really rough track, and the cars move around a lot getting up to speed. It looked like that happened to Carl. But it turned out he wasn’t loose. He was trying to switch lanes and get into a small hole in front of me. I misread it. By the time I figured out what he was going to do, I was just barely at his bumper. I jammed the brakes. He turned down really quickly, got loose, and wrecked. It was completely innocent on my part. I had no idea what he was trying to do. It was really early in the race. But Carl felt that I really could have given him a break. I think he was also frustrated by all of the events that came before, and as I said, there was kind of turf war was that was going on. Then, toward the end of the race, Carl wrecked me. It looked almost identical to what happened to him at Talladega, which was crazy because you can’t plan that sort of thing. I flipped. What I remember most was the world turning upside down. It was similar to playing with a bigger kid or your dad. They pick you up and throw you upside down. That’s pretty much what it felt was like except that I was going 190 miles an hour instead of two. The crash knocked the wind out of me. The way that stock cars are built, when you’re in a major wreck, you tend to have a lot of issues with your knees and your feet. You’re kind of like, “When am I going to get the feeling back in my legs?” You’re not sure if something’s broken, or you’re just stunned. It took me a minute or so to get all my feeling back. That’s just part of it. When I talked with Carl after Talladega, he had said that he’d understood. He’d said that if he were in my shoes, he would probably have done the same thing. But he kind of retracted that in his interview after Atlanta, which was pretty strange. One thing was definitely clear: Things weren’t all right between us. After Atlanta, I moved on pretty quick. I had bigger concerns than my rivalry with Carl. My biggest concern was winning the Nationwide championship, so in that sense, I didn’t have time to focus on the rivalry any further. And after that race, he seemed to think that things had evened out, and that it was all said and done. I couldn’t take back the wreck, fix the car and re-run the race. So what was the point of carrying it on any further? I felt that we were done. NASCAR agreed. They set up a meeting with Carl, me and the owners, and declared that it was time to move on. I lived up to that word. Then in July, at the Nationwide race at Gateway, Carl wrecked me again. It played out rather awkwardly. We were much faster than he was. With a lap or two to go, Carl got out in front of me on a restart, and I ran him back down. I got underneath him to pass him. I got really loose and slid up the race track into him. He did a hell of a job keeping control of his race car and keeping from wrecking. I’d like to think that I did as well. And we went on and we raced to the next corner. Then I passed him cleanly at the next corner. At that point, he bumped back up into me and wrecked me really, really hard, and went on to win the race. I talked to Carl again after that. “This is over,” he’d say, “This is over.” I would agree. It was essentially a re-run same conversation we’d been having all along. Things needed to be different. How that was going to happen was unclear. Two weeks ago, after we won the Kobalt 400 at Vegas, I thanked Carl for helping me get to Victory Lane. He helped push Dale Earnhardt Jr. to drive as hard as he could on the final laps, which in turn, forced Dale to use up all his gas. Without Carl, I might not have won that race. It’s funny how things change. Here’s the thing. After I won the 2012 Sprint Cup Championship, a lot of the stress of my rivalry with Carl — or any of the rivalries I’d built over the years — kind of went away. When you win, you feel like you validate yourself. And when you get validated, you get more respect from your competitors. At the end of the 2012 season, Carl and I also became teammates with Ford. If one Ford is strong, it makes all of us strong. We all have shared interests. No one needs to tell Carl or myself the importance of working together. We’re smart enough to know it on our own. In all honesty, I don’t have any reason to dislike anyone. I’m very fortunate to be where I am in the sport right now. I don’t ever take it for granted, or use it to be vengeful. I try to be the bigger person. I don’t know how my relationship with Carl will evolve, but I can tell you this. If you ask me who the best driver is in the Cup Series right now, I would tell you it’s Carl Edwards. I’d put him above Kyle Busch. I’d put him above Jimmie Johnson. I respect how Carl drives. I always have, and probably always will. Well brad like you said it’s everyone in that is there to do one thing and that is win , so you always race the way it should be done and you will have all the success in the world like you deservedly should.